Do you know why most monkeys generally enjoy eating bananas? It’s because they quite often find them very-very appealing. A-pealing, get it? If not, then I’d suggest that you’d grown, sigh, and growl, before reading the following comic book. It was created by Joshua Williamson, Carmine Di Giandomenico, Carlos D’Anda, and published by DC in March, 2018! TO QUOTE Richard Dawkins: 'We admit that we are like apes, but we seldom realize that we are apes'. 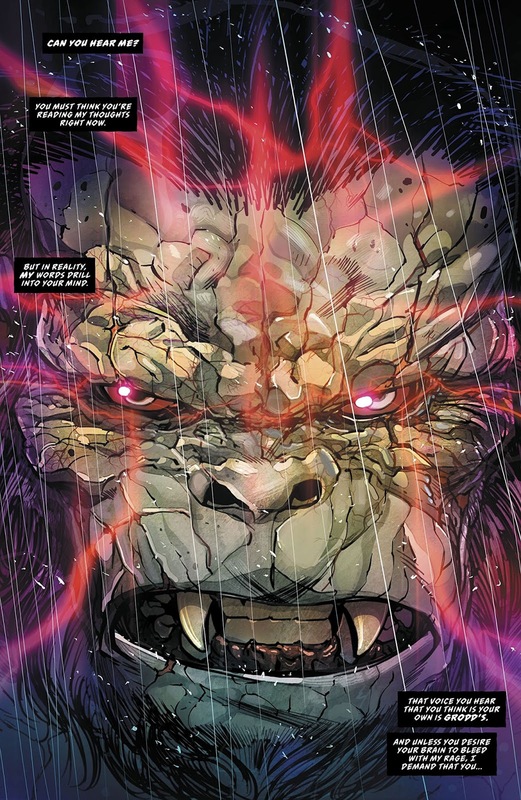 A few years ago, Gorilla Grodd was infected by a mysterious malady which is slowly causing him to die. So to try to cure himself of this very rare disease, he travels to his local hospital so he can ask his doctor for some help. No. Not really. Although I’m sure that would have been a lot easier compared to what he ended up doing: That being to devise a cunning plan where he, Multiplex, Raijin, Meena, plus the Black Hole gang, join forces so they can steal the Flash’s powers in order to find a cure. And do you know what? His plan actually works, in part, and this leaves Barry completely powerless and every man, woman, and child, frozen, in suspended animation, without any hope of breaking free from Central City! Part One) GO WEST: When a writer attempts to elevate a fairly simple story into a grand and epic tale, sometimes the end result can feel somewhat shallow and forced, bordering on the superficial. That said, however, it has been known that the opposite can also be true. 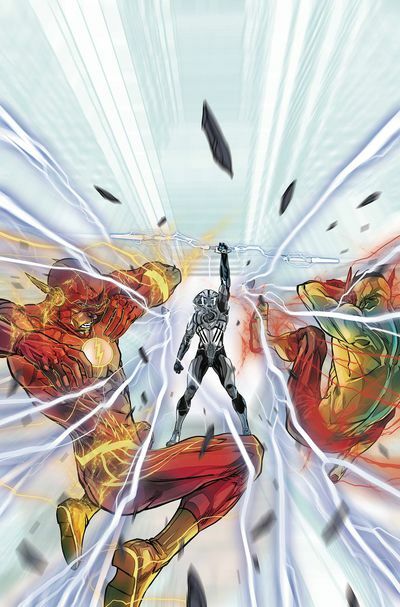 Take these two episodes of The Flash, for instance, issues 40 and 41. 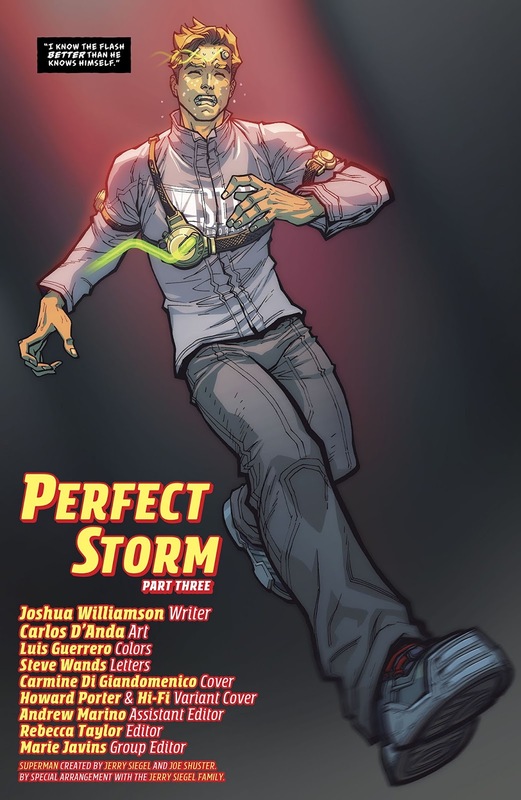 At face value, Joshua Williamson’s script seems like a very simple script to follow: Gorilla Grodd wants to steal Barry’s powers so he can cure himself of a mysterious debilitating disease. Yes. That’s it. That’s the story. The whole shebang. 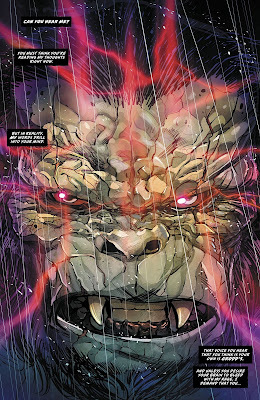 But to add some spice to the mix it’s complemented with a fairly extravagant twist: Grodd’s plan actually works, kind of, and this results in Barry losing all of his abilities. All of them. Every single one. Just for the time being, anyway, just until someone can come along to put things back to normal again. In the meantime, though, who would be a suitable candidate to replace him? I mean, can anyone think of a well-groomed individual with a red costume who can run really fast? Wait a minute! You’re not thinking about the same person I am, are you? But can he do it? Can Deadpool find a way to stop f@cking cursing and replace the fastest man alive? Ha! I’m only kidding! Of course I’m referring to Wally West, the white one, who I’m sure would be a suitable replacement considering he’s taken on the Flash mantel since 1986. In fact, when I was growing up, he was the first real speedster I actually knew, and I did enjoy collecting his adventures and seeing him evolve, transforming himself from a wannabe upstart into the man he once become! But having said all that; is he still the same person? I’m not entirely sure, to be honest, and I say this despite having read every single one of his appearances since the start of 'Rebirth'. He seems like the same guy but appears broken as well, somewhat deflated, and I attribute part of this due to his split with Linda Park plus the loss of his now unborn children. Well, that must have hurt, mustn’t it? Even if the latter of these two facts haven’t yet been addressed! I hope it does though, and I hope this new story-line also brings Wally back into the forefront again. After all, he is a great character and deserves a lot more time in the spotlight. Part Two) MOVING VIOLATION: Something else about this adventure I thoroughly enjoyed has to do with the way Grodd broke Barry. Well, let’s face it, nobody likes to have their flaws highlighted, enhanced, and shoved down their throats, especially when it’s backed up by some hard-core psychic torture that can corrupt the mind and damage the soul. What’s more, having your powers taken away from you must also be a damn right drag! Still, it did happen, and now Barry doesn’t really know which way to turn! Or does he? It was a good sequence, nonetheless, because you could almost feel his innermost frustration driving him down, down, down, into the pits of despair, before transforming him into a desperate individual looking for some sort of guidance and direction. In fact, his anguish was so obviously apparent — what with the way he spoke to Wally as well as his general demeanor whenever he’s around the wand — that it’s starting to look like he’s regressing to who he once was prior to becoming a hero. Which kind of makes sense, up to a point, although it doesn’t explain why he’s pushing away those people he’s currently close to, keeping in mind that he’s ushering in one specific person he currently isn’t, wink-wink! Seriously, why would he want to do something like this? Is it because he doesn’t want to see his loved ones getting hurt? And if this is the case, that point wasn’t clearly made during issue 41. On a more positive note, however, I did enjoy the inclusion of Avery and the two Wally's in this adventure. 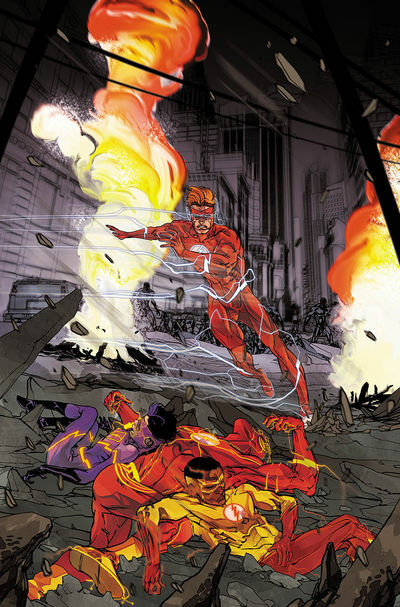 After all, since the mid-60s, every series of The Flash has tried to maintain some sort of semblance when it comes down to establishing a family unit, be it with Wally and Linda, Bart and Max, and of course, Barry and Iris. So, despite the circumstances, it was nice to see this brand of homegrown unity flourishing once again. 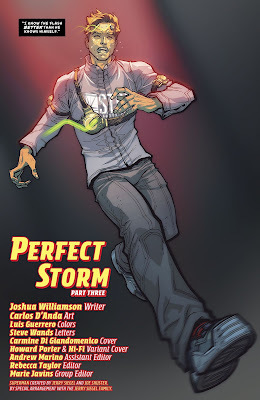 Let’s hope Joshua Williamson thinks along similar lines and continues this trend by showcasing a cast of unified characters who don’t keep on arguing amongst themselves. What do you think; dear reader? Do you prefer your comics to be full of pointless infighting? Similar to a daytime soap opera! Or do you prefer them to be more story-focused? Similar to an episodic crime drama! Also, how do you feel about the circumstances surrounding Barry’s power loss? You know, all that stuff about magic wands and monkey-made lightening effects. Personally, I’m not a hundred percent certain myself. While I can understand that this sort of thing helps establish up-and-coming story-lines and character ideas, in the same breath, the act of taking away Barry’s powers does seem a little bit cheap somehow, disposable even. Part Three) THE ART OF TWO WORLDS: Have you ever tried to draw a picture of people in motion? If so, then I’m sure you must know that it isn’t easy transforming a static image into a kinetic flow of visuals. To begin with, a background has to be put in place accompanied by each of the main figures (hero, villain, street, or tree). Once that’s been done, each element within the scene has to then be stylised, sculpted, and correctly rendered in order to reflect what the story is trying to say (the sun shining, a hero smiling, a villain hanging from a tree. After that, color, shade, and depth are added to the mix; so the final image can match the writer's initial intent (a happy hero smiling on a sunny day while a villain hangs from a nearby tree). And last, but not least, this step-by-step process has to be carried out again, and again, and again, each time signifying a shift in what’s happening, where it’s happening, why it’s happening, and how it’s happening. Yeah. That’s right. It’s as simple as that. Even though it isn’t very simple being an artist because they can sometimes spend up to sixteen hours a day drawing, shading, inking, or coloring in a series of images. Yet, as luck would have it, these two episodes of The Flash have found two men more than up for the task. Issue 40 was illustrated by Carmine Di Giandomenico, and, as you can clearly see from the pictures provided, his style of art is very lucid in tone despite being very dramatic in temperament. 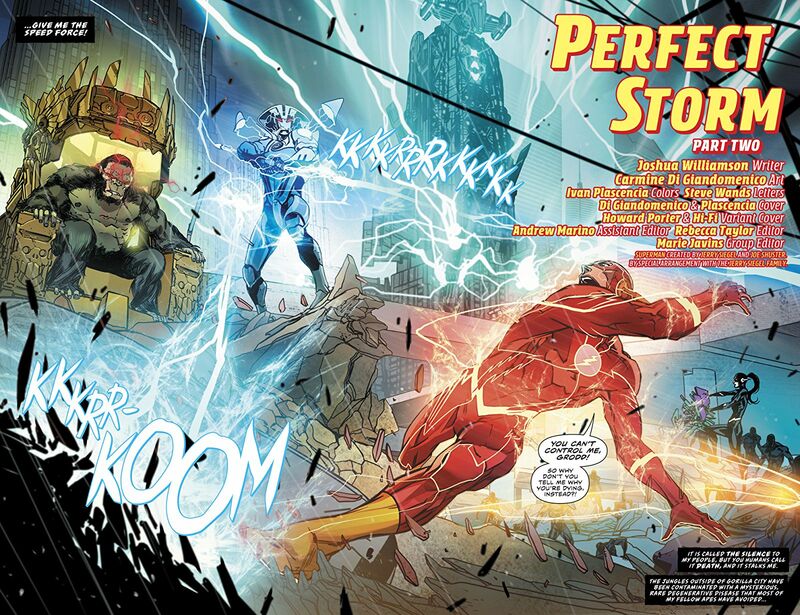 A good example of this can be seen in the first few pages, because on page one he drew a big picture of Gorilla Grodd’s angry looking face, Ooga-Ooga, whereas on pages two and three he drew a double page spread illustrating Barry trying to outrun his grasp. More or less I thought each of these pages was very visually stimulating and goes to show how much power an image can possess without being a tangible commodity. Along similar lines, I can also say the same thing about Carlos D’Anda’s artwork, the artist for issue 41. Except in his case, his style of art is far more conventional by design, despite having a cartoonish edge when expressing emotion, depth, and visual continuity. Which is a good thing; all in all, as it goes to show that no matter who draws this book, it’s normally someone who can draw a picture of people in motion. Do you know what song was running through my head during that scene where Barry helplessly fell through the sky? Yes. That’s correct. It was the following song harmonized by Coldplay, “Speed of Sound”. Now I know this may sound rather silly, but the one thing that always slows me down is when I eat a big dinner. Go on, try it yourself so you can see what I mean. Stuff your face like there’s no tomorrow, and see how long it takes before you want to... tooo... yawwwnnnnn... Zzzzzzzzz. Godknows: Wasn’t that a Beach Boys song? Iron Man: That was a Black Sabbath song! Wonder Woman: She’s no song, more of a melody! Doctor Hugo Zee Hackenbush: What was the question again?